Time & attendance system is a system for tracking employee time spent in the workplace, either through manual or automated processes, for the purpose of payment for hours worked, number of items produced or type of work performed. Time and attendance solutions with Genuine HID Technology™ allow you to easily collect and record employee data in a more convenient manner. Our partner solutions utilize dual frequency, multi-technology Genuine HID® reader technology to support a complete range of legacy and high frequency card formats. 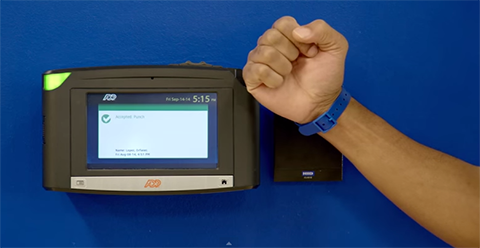 This allows you to leverage your existing Genuine HID physical access control badges for time and attendance applications. Accurately record employee when they enter and leave work or school. Maintain productivity with time-stamping that eliminates additional steps by employees. Fully integrate into existing physical access systems and create a pathway to combine your logical and physical access control needs. Comply with local work regulations with streamlined reporting to local or national workplace regulatory agencies. Leverage Genuine HID® access control badges for more than just opening a door. Successful implementation and integration of a converged access time and attendance solution can require a highly specialized level of support. For complex projects, HID Global offers a depth of expertise, end-to-end project management and technical knowledge through its Professional Services team to help reduce risk and accelerate value for your business. Securely communicate with iCLASS SE® enabled smart cards and mobile devices.